Over two years ago, before Nintendo introduced the Virtual Console Arcade, Capcom released the NES port of Ghosts 'n Goblins on Virtual Console. Arguably the most well-known version of the game out there, it's infamous for being an incredibly challenging and, frequently, totally unfair game. While it would go on to get a bunch of great sequels, the original game was really fairly average in terms of quality. Is the original arcade version of this relentlessly difficult game any better? If you're looking for gameplay changes, you're not gonna find many here. Arthur must still plow his way through six increasingly difficult stages, using five different weapons, to eventually take down his nemesis Astaroth and rescue the princess. The stages are exactly the same in layout as in all later ports the game would get, so the only real differences you'll notice are, naturally, the superior graphics and sound. Arthur is of course as fragile as ever. Although he's wearing a full suit of armour with every new life, it'll fly off if anything so much as brushes past him, leaving him in just his boxers and giving him just one more hit before turning into a pile of bones. 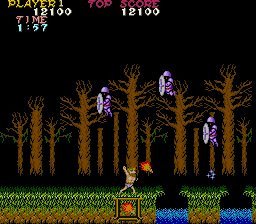 In the original Ghosts 'n Goblins, it's still possible to find a replacement suit of armour, but it only appears if you're in your boxers once you get to the very specific spot where it appears in each level. If you're in your armour when you go past an armour spot, then lose it later and try to return to get it anyway, you're out of luck. There are also no higher suits of armour than your standard set, so your weapons will not eventually grow stronger and get special attacks. Believe us when we say you'll lose your armour a whole lot more than in other games in the series — the Red Arremers, those erratic flying devils, appear in all but one stage, and they seem especially unpredictable in this first game compared to the other titles. Most of your deaths will probably be at their hands! Arthur starts out with his all-time favourite lance, but unlike the rest of the games in the series you're not gonna find much better equipment. There's only one which is ever so slightly better, the dagger, but all it does is offer a small increase in your throwing speed. However, like the NES game, you're forced to use what is arguably the worst weapon — the shield — to beat the final stage, otherwise you'll simply get sent back to level 4 and be forced to get it if you want to progress. Only if you beat level 5 with the shield will you reach the final boss. Should you beat him, which is honestly pretty easy compared to, oh, everything else in the game, you'll be greeted by the trademark of the series and perhaps the biggest trolling in videogame history: you'll get sent back to stage 1 and will have to beat the whole game a second time if you want to see the "true" ending. The second time around, enemies are much faster, so you'll have an even harder time doing it all again. Although this arcade version costs 800 points compared to the NES version's 500, there are some incentives which might warrant the extra cost. Like most of the available arcade games, there are some options to fiddle around with, although they're mostly limited to lowering or increasing the difficulty and changing the score totals at which you get extra lives. The NES version only has one difficulty level, so this may be a blessing for those not good enough to beat the game on its default difficulty. You can also change around the button configuration, which is always handy. The arcade version of Ghosts 'n Goblins is almost identical to the NES game, offering little more than better graphics and sound. Everything else, from level design to enemy placement, is exactly the same, so if you've already played the more well-known version of the title, there won't be much here for you other than the satisfaction of your curiosity. The configurable settings offer a tiny bit of extra value, but there's really no reason to pick this up unless you're a big fan of the series. 800 points may be costly but this is the true version of the game while the NES version is the inferior port. Whether you get this or the NES depends on whether you want to play the game properly, as it should be (and willing to pay for it) or just simply experience it, watered-down. This is the VCA game I'm looking forward to most. I can't wait for it to come to the USA. hmm i wonder , ive never played the arcade version. it just hit me i think GNG would be a really nice rpg game if they actually gave it a more in dept story , never know. Nice review keep em coming. Ahh I remember seeing this game in the arcade in 2002 before I ever heard of the series. I played it for the first time not knowing what to expect and upon playing the first level (and never beating it) It felt hard but not "extremely" hard. Something about the game kept wanting me to come back to it after I left and played other games. Maybe its the music, graphics, and controls. Of course Pole Position, R-Type II, Metal Slug, and Ice Climber were great at that arcade too. Seriously, a joystick and concave buttons are the way to play this game. I spent many years looking into this series hoping to play it again (specifically the arcade version) and could only find the weird sequels. The PSP version might be the penultimate title for the simple addition of *ahem idk, BEING ABLE TO SHOOT DIRECTLY ABOVE AND BELOW YOU! There are many flaws with the series as stated in this review, but this game is fun to just pick up and play without trying to beat it. It had better be released in the States! I have the NES and this version, but only the Arcade brings back the childhood memories, as if I just played it last week, and not about 20 years ago. Great game. Hoping this year will be a strong one for VCA. Hoping that Street Fighter 2 champion edition comes out as it has my favourite colours for P2 side. Ryu in grey with the blue headband. Also some nasty redizzy combos can be done with M bison (Flying kick, jab light kick, standing medium kick, medium scissors kick, jab light kick, standing medium kick, scissors, jab light kick) and Guile has one too. Still waiting for Super Hang On and more titles from Sega as well. 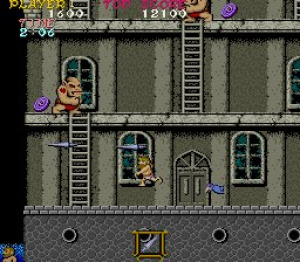 I practically grew up with Ghouls 'n' Ghosts (for Genesis/Megadrive), later found this game for our crappy old 386 computer (or maybe it was a 286... by that point I was old enough to know that it was worthless), then later played the crap out of Super Ghouls 'n' Ghosts. Then while living in Japan I found the Daimakaimura trilogy for Saturn, and played through them all. So recently, I just happened to find the original arcade version. Granted, it's been a number of years since I played any games in the series... but it wasn't even remotely fun. After I realized the game was designed to take my money (fortunately, this was the kind of arcade that actually understood that vintage arcade games were designed to be profitable, not fun, so they didn't over-charge), I decided that all I wanted to do was to beat the built-in high scores and/or beat the first level. I eventually did both, but man... it wasn't easy. Or fun. I felt like skill had nothing to do with how I was playing, and even memorization wasn't helping. It was just terrible, and even though I knew the non-arcade versions of the games in this series that I had loved as a kid were equally punishing... after all these years of playing video games I felt like I should only been better at a game from this series than in the past, not worse. Forget this game. If I really wanted to punish myself, I'd go re-play the Saturn trilogy that I decided to hang on to. At least then I'd feel like I'm getting my money's worth. Incidentally, on one of my last few trips to Japan, I found a Ghosts 'n Goblins-themed t-shirt (like... a modern, brand-new t-shirt with a vintage theme), but it was the day before I had to come back home and I was completely broke, so I ended up not buying it. I will forever regret that decision. Though in my experience, it's hard to hitch-hike on trains in Japan, so maybe I made the right decision after all. Awesome. Can't wait to get this in the US. Great review man. Good review, Drake. The first GnG title is decent, though its sequels (save for Ultimate Ghosts'n Goblins, which I thought was a tad disappointing) I find much better. I still need to beat the second stage of this game. Yeah, I'm waitin' on this one. Gotta beat it twice for the real ending, huh? wow. 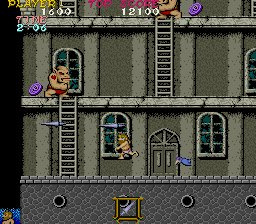 It's not so much of a problem going through Super Ghouls'n Ghosts twice, imo, I've done it many times. I've yet to do it in Ghouls'n Ghosts; at least, I will anyway once I beat that boss in the fifth stage. I am far from reaching Ghosts'n Goblins' second quest. Looks like a fun and challenging game! @StarBoy91 im still stuck on the last level boss second time around. I remember dumpin alot of quaters into this game but it was great fun. Is there any hope to see the arcade version of Double Dragon on the VC? I liked it alot better than the console versions. Is this game worth getting then or is it just too hard? @Scottie. You can set number of lifes up to seven, and continue after game over, so the hardness will not stop you from going to later stages if you just give it a try. Never tried this infamous game, or any other game in the series before, so maybe I'll jump into this arcade version just for the heck of it. This is very intriguing, i can beat the SNES ghoul's n ghost (I count one playthrough beating it btw, but could never quite get to the end in this one on the NES. Still have never played the Genesis version. Going to download right now actually. I'm just going to buy the Capcom Arcade Classics collection for the Playstation 2. Also seeing the SNES and Genesis both in action by the same developer and similar game just confirms the SNES's superiority. Ghouls n Ghosts actually looks better on the TG16. This version of the game also has in the Options the ability to stretch and zoom the screen (so you don't see those annoying black bars). This is a nice version of the game, glad I downloaded. Well there is if you are an American and have been putting off buying the NES version. I seem to get the feeling that this review is telling us to not bother with the arcade version and just get or stick with the NES version solely because the NES version is cheaper despite it being a poor port. You can't beat the soundtrack from the original. Good riddance to the NES port as far as I'm concerned. Also....this has been bugging me. Is it "Ghost n Goblins" or "Ghosts (plural) n Goblins"??? The arcade poster calls it Ghost n Goblins but once it got ported to the NES, I guess they added the "s". @berzerker99 - good eye, man. 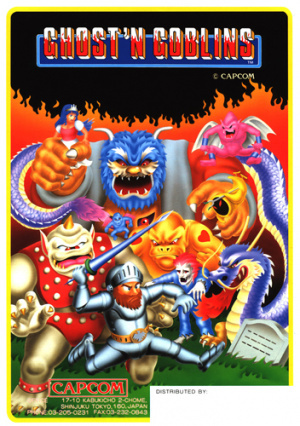 The true title, however, is Ghosts'n Goblins, as far as I'm concerned. @StarBoy91 - I agree with ya 100%. Does the game have infinite continues? you mean the NES version is almost identical to the arcade version, since the arcade version was first. its not bad though, i've actually seen a review on another site that claimed this arcade version was a port of the NES version, which is laughable. in any case, i realize that arcades have been gone for more than a decade (at least in the US, not in asia), but many games in the nes generation of games were inferior ports of arcade games. many games back then started development in arcades first, and were an afterthought on the weaker home consoles. while i agree that the nes port of this game is the most famous port, obviously this arcade game is the definitive version. so i would say that if you were to buy one version of the game, get this superior version, and stay away from the nes version. its an arcade game, so you can put as many 'quarters' as you want; just like all the other arcade virtual console games. the best way to play it is probably to think about how much money you would have had in your wallet (for example $5, or 20 quarters), and make that your limit for any one session. that's probably the best way to approach any arcade game on virtual console, or even mame. Oh my goodness this is so much better than the NES port. You can actually see what things are supposed to be. Turns out, those trolls aren't trying to take a dump on you . . .
And I'm not sure I agree that the shield is the worst weapon. While the range is horrible, the more shield-y aspects of the weapon are much appreciated in level 5 . . . which I still can't get past. Back in the 80s, I bought the Commodore 16/+4 version of this game. It was so bad that nobody would believe it. There were screenshots of the arcade version on the box and I seriously thought the game would look like these screenshots. I'm glad the most notorious arcade game of the 1980s has finally made its way to the VC Arcade. I downloaded it a few weeks ago. Although 800 points is quite an asking price for something that most people are going to buy for nostalgic purposes, I found it to be a fascinating romp. And, I am most certainly thankful for the option to readjust the difficulty. It took me about two nights to finish the game on the easiest difficulty setting, but not after non-stop playing. 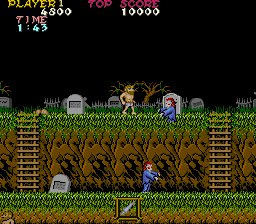 Hopefully Capcom will decide to release the arcade version of "Ghouls N Ghosts" to VC Arcade as well. And, I'd especially like to see the Commodore 64 version of this game make its way to the VC as well. I'm so glad when stories have happy end. This version is much harder than the NES version you cannot get through it by learning how things move because they adjust by a few pixels. Bit annoyed they never bothered putting Ghouls and Ghosts (Arcade) on the VC (I presume by the fact they put the arcade version of strider on that they have made a CPS1 emulator). Or released the PC Engine version in Europe. (Plays more like the Arcade version than the Mega Drive one and it would be in 60hz the colours / sound are less important than whether it plays right).